Friday night the faithful few braved inclement weather to hear Jean-Yves Thibaudet and the Boston Symphony Orchestra in Tanglewood’s Koussevitzky Music Shed under the direction of Marcelo Lehninger in a program encompassing Tchaikovsky, Shostakovich, and Schumann. Tchaikovsky’s Serenade for Strings Op. 48 (1880) takes the form of a classical-era divertimento in four movements. Lasting some 30 minutes, this work is a tribute to Mozart and one which the composer “wrote from inner compulsion” and described as “a piece from the heart.” For all that the composer looked backwards for its form and theme, the composition, like his Variations on a Rococo Theme, is unmistakably his: the richness and density are particularly Russian romantic. It opens lushly with the amassed strings intoning a chorale that commences the Pezzo in forma di Sonatina and encodes an unspecified yearning that continues after the first thematic statement, Andante non troppo, concludes on an emphatic chord. Continuing in a softer dynamic, the theme turns wistful before launching into the Allegro moderato section where the flurry of notes in the celli provide agitation and momentum and set the orchestra off at a flying development before the Andante returns now finding harmonic cadence if not a resolution of tension. The second movement Valse recalls Tchaikovsky’s ballet music, the melody inscribing arabesques of suspense and lift like an approximation of the dance’s ideal of defying gravity. The third movement Elegia: Larghetto elegiac is more of a nocturne: unremittingly lyrical, and here played with a suitably soaring spirit (continuing on from the waltz)—full of depth and emotion even if not in a vein I would characterize as elegiac. The Finale, Tema Russo is based on a tune with a lilt in it that follows on the preceding movements and creates a tighter connection between the last three movements than all four of this serenade. The performance as a whole, for all its flurry of notes (it is, after all, Tchaikovsky) was quite the opportunity for the BSO strings to shine forth, to the audience’s delight. After a rearrangement the stage, the compositions moved across centuries but not geography as we embarked on Shostakovich’s Piano Concerto No. 1 in C Minor, Op. 35 (1933). Continuing the playfulness of the composer’s early works and benefiting from a spirit of freedom and relaxed creativity that preceded the Stalinist repression, this concerto thumbs its nose at the Romantic idea of a concerto, rejecting such visions as that of Rachmaninoff fourth piano concerto, composed only five years prior. Orchestrated for strings and solo trumpet, and ably blown by BSO’s principal Thomas Rolfs, this fascinating, protean concerto plays with texture, color, and timbre—as well as form and theme. The first movement shows the intimations of jazz (and is a nice antecedent to Shostakovich’s 1934 First Suite for Jazz Orchestra): the opening flourishes from piano and trumpet launch a movement that unfolds with lyrical logic as it plays with expectations, somber themes ceding to rapid passages where least expected. High spirits are the order of the movement. The second movement, Lento, alludes to a waltz without ever quite becoming one; the hallmark here is subdued passion injected with sly wit. The third movement, Moderato, commences and ends attaca, showcasing the solo piano in both cadenza and counterpoint with moments of manic play before the quintessential sound of middle-period Shostakovich rounds it out. Frenetic sarcasm is interspersed with fragments of great, slightly dissonant, lyricism. The concluding Allegro con brio sounds like a madcap film score and ends the concerto on a flourish. Thibaudet gave a very insightful, varied, and exciting performance with the able cooperation of the BSO. Rolfs was a swinging and sweet-toned addition in a work which really should be known as a “piano concerto with trumpet obbligato”—if not quite a double concerto. 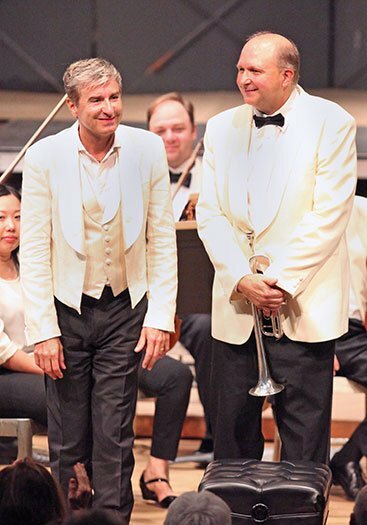 I am glad Thibaudet has embraced this work and is touring it; formally curious and no doubt a difficult program to sell to orchestra management teams (it was first heard at the Symphony Hall in 1986 and most recently at Tanglewood in 1992), this composition merits greater renown and more frequent performance, especially in such capable hands. The full orchestra took the stage to conclude with Schumann’s Symphony No. 4 in D Minor, Op. 120 (original version 1841; revised version heard on this program dates from 1851). In the revision some of the spontaneity is lost, transmuted into a more self-conscious importance. The organizational structure carries a weightier burden for the work as a whole, perhaps more than it should. Overall, the symphony remains lively, touching, highly effective and here rendered with gusto and pomp. No matter the composer’s angst, this was a solid performance full of nuanced variation in articulation and color, bringing out the individual voices, the innovation, and the sonic pleasures to be had even in this over-determined edition. Finally, it remains for me to say a few words about the conductor. 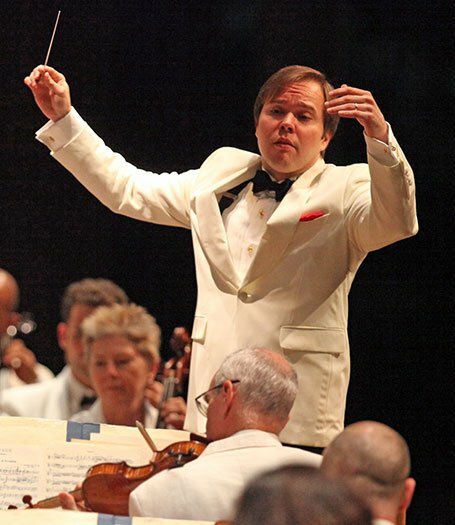 Marcelo Lehninger conducted with great clarity and direction. I was struck by his conducting before the beat throughout this concert. Personally I struggle with this phenomenon conceptually, and have discussed it with conductors of my acquaintance. I understand asking brass or winds to play before the beat and strings with the stick, so that the sound reaches the edge of the stage at the same time. Lehninger seems to conduct a full beat before the play, which is a greater degree of separation than I recall noticing from others. In the Tchaikovsky I regretted that his gestures gave away the changes a couple seconds before we heard them (and I took to looking away from the stage so I could concentrate more on the sound). Such a disconnect during the performance of a concerto was also a surprise to me, since this is a time when an orchestra especially relies on a conductor to keep soloist and ensemble united. I thought some of the orchestra entrances throughout this concert were less coherent than I have heard them play and do wonder how much of this reflects the musicians’ own adapting to the time lag between stick and sound. Lehninger clearly has a good sense of what he directed, but I wonder if directing more with the players rather than ahead of them might not have improved the performances especially in the Tchaikovsky and Shostakovich.